All opinions expressed in this novel are the opinions of fictional characters. If anyone or any group gets offended, please accept the author's apologies. "A most remarkable homage to things Israeli, things Jewish, things human. Avilan, speaking directly to her beloved country . . . writes about Israel with the love and pain stemming from the realization that not all that we love is perfect, but we can't help loving it, or him, or her. 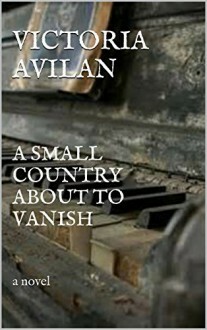 A Small Country about to Vanish is love's survival story, between the author and her country of Israel, between Shelli and Rona, between a mother and her children, between a husband and wife. This book almost reads itself, so sure-footed is the pacing, the ease of being drawn in despite some unease about what is written. The author does not intrude on her characters with the pointed finger of too much message forcibly delivered. A reader's ease and ability to identify with each main character is to have witnessed Avilan's magic literary show. This is a tense, taut and shocking study of freedom. Freedom to love, to live, to remember or forget how one obtained and lost those freedoms." -- Historical romance author T. T. Thomas.